We stayed here one week in July 2016 and could not wait to leave. Permanent residents' units for the most part were trashy, a few had done some "landscaping" to try to improve their sites, but the overall atmosphere was shabby and cluttered. No standards of cleanliness were enforced. Some units had decrepit add-ons. Sewer odors were obvious as we walked around the park. We quickly found another park in Valencia and moved with great relief. We camped at Castaic Lake RV Park in a Fifth Wheel. Go anywhere else. Boondocking would be preferable. Park manager stayed to help us around 6 PM, very nice folks. Well maintained park. Spacious clean sites. We did not have to unhitch our 40 ft fifth wheel! Bathrooms sparkling clean, large clean showers, with nice decorative touches. They have trash pick up at the sites daily. I would definitely stay there again. We camped at Azalea Acres RV Park in a Fifth Wheel. The park is off the highway, down a couple of rural roads, turns, but no problems navigating. The restaurant at the highway intersection truck stop has good food. The sites are quite cramped, and though they are angled pull throughs, we had to back-and-forth quite a bit to get comfortable. Thankfully no one needed the site on one side, or they would not have been able to put out slides. The park is clean, though a bit shabby. The men's restrooms were clean with adequate showers (according to my husband). The women's showers were dribbly, so I opted to shower in the trailer. This is a first-come, first served campground, with few sites. The pull throughs are wonky so difficult to park in. The back ins are for shorter vehicles. If a pull through is not available, you can use a back in until one comes available. Most people stay only 1-2 nights. The park is quiet, except for the peacocks. Deer wander through, also, as well as wild turkeys. We camped at Caverns of Sonora RV Park in a Fifth Wheel. The cavern tour is excellent. The first dormant part is a bit dry, but the living cave section is wonderful, very intimate, as everything is right there, but do not touch!! The campground is in a stunning setting, with spacious sites. We camped in a pull through E19, with 30-amp and water, no sewer, but there is a dump station. E 20 was originally assigned, but it was difficult to back in with a 40-footer, so the neighbor in a Class B changed with us for his pull through. The host was fine with that: no hassles. 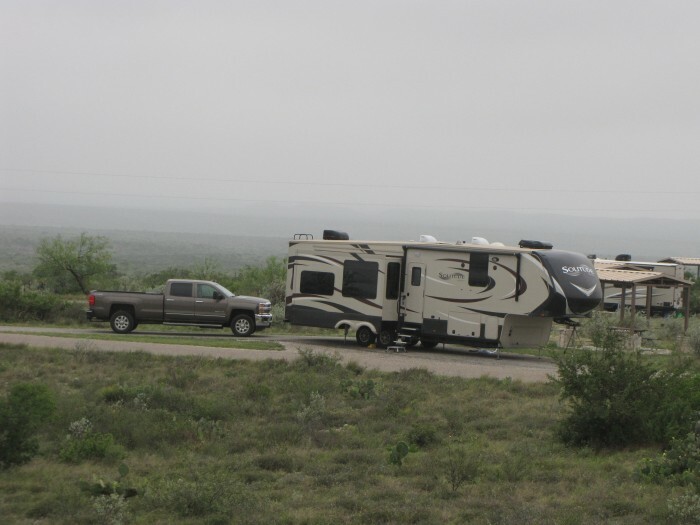 We camped at Seminole Canyon State Park in a Fifth Wheel. Nearby Seminole Canyon has excellent pictographs, accessible with guided tours for nominal cost. We stayed two nights here. The bathrooms are dank and unappealing. The showers are $2.00 for 6 minutes. I refused to use the facilities. The water faucet to a neighboring site had been broken off by another RVer a week earlier; he took the site we were assigned and reported it to the office, but they put just a shut-off valve on it, not another faucet. Because he was in our site, we had to futz about for another site. They assigned that site again to another RVer, who also complained to the office and had to move to another site. Although some sites had a picnic table, ours did not. Wi-Fi is available -- at the cafe, but not at the sites. Cell service is spotty. The cafe food was mediocre. 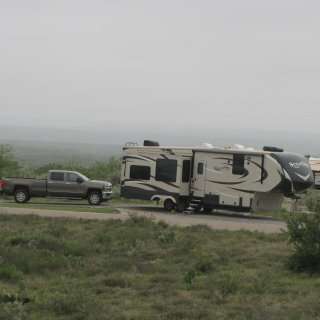 We camped at Big Bend Resort & Adventures RV Park & Campground (Big Bend Motor Inn) in a Fifth Wheel. This is a new park, still under construction. All the electrical, water, and sewer were complete at our stay, but the bath/laundry amenities were still under construction, and landscaping is yet to be done; there is some grass and small trees, yet to fill out. While a bit rough right now, Bud's Place will be awesome when completed. The sites are gravel and level pull throughs, with spacious areas between. Interestingly, RVs pull in from the opposite direction from neighbor, so two share a grassy area, with doors facing each other. Very neighborly. Despite the construction, we had a pleasant stay. It is off the beaten path (about 2 miles from the main highway through town), so no loud traffic noise, and though not near a railroad, one can hear the mournful (some say romantic) wail of the train in the far distance -- not bothersome, though. The manager is very efficient and accommodating. We were provided a cable box, and that evening, when we had difficulty getting the signal, I texted her after hours that we would need help in the morning. She responded right away and came over that evening to help get it going for us. The park is close to town in one direction and to Walmart in the other. Nothing is very far away from anything, as Carlsbad is a small town. It's about 30 miles from the entrance to Carlsbad Caverns NP. 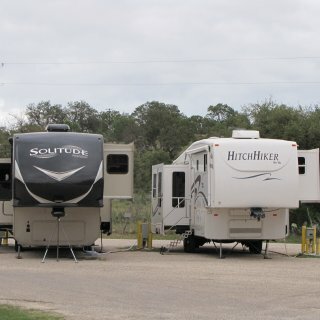 We camped at Bud's Place RV Park in a Fifth Wheel. Carlsbad Caverns 30 miles away; Albertson's in town for shopping. Walmart just down the road a bit. There are food establishments for eating in and dining, and a few that deliver! Despite being a tad overpriced, Gouldings RV park is on my list to stay if I return to that area. 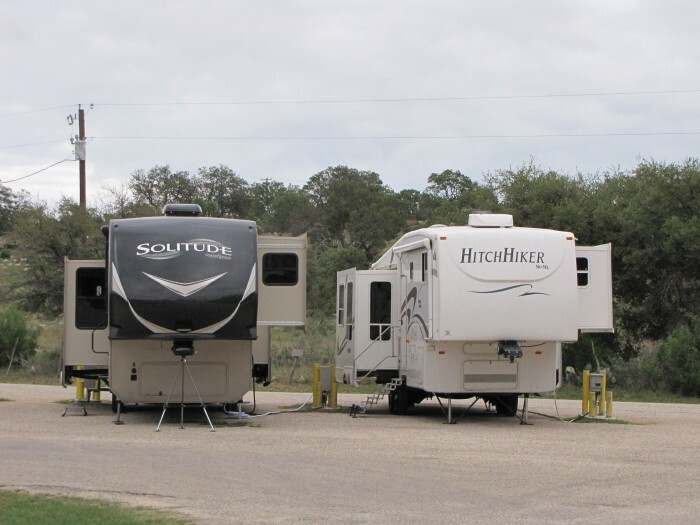 The staff is friendly, the park is very clean, and the RV spaces are easy in and out. Very clean, trash containers close to the sites. Utilities functioning, though water pressure was a bit low. The facilities (bath, laundry, pool) are not centrally located, though, so if you're parked on the far edge, it's a trek. On the whole, it is very clean. The resort shows John Wayne movies for free in it's tiny theatre - each night rotating through a few movies that were filmed there - Stagecoach (BW) being the most popular as it was John Wayne's breakout role and showcased Monument Valley, initiating the public to its wonders. The grocery store is not really walking distance because the RV park section of the resort is up a steep hill from it. The on-site laundry facilities are clean but overpriced. The laundry facilities near the store were even more expensive. We camped at Goulding's Lodge & Campground in a Fifth Wheel. I would not take a Gouldings' tour again. We opted for the 2.5 hr afternoon tour and were disappointed. The guide was not friendly when we started, though he did loosen up a bit later on. The first part of the tour consisted of visiting "Lucy", a Navajo woman in a hogan carding, spinning, and weaving a blanket. Though it was interesting, the overall impression was that he was trolling for donations for her. During the tour, he took us on one "guide-only" road and missed quite a large part of the 17-mile loop. We had done the loop ourselves in the morning and wanted to revisit it in the afternoon for the different light, and missing that part meant that we missed good light on some of the features we were looking forward to seeing. If you can, check out the guides inside the park before committing yourself to a commercial tour.